When you have an incomplete smile due to missing teeth, your self-esteem and quality of life are often impacted. While dental bridges and partial dentures are the affordable options, you do have another more natural-looking solution to treat tooth loss. Dental implants are a permanent solution to transform your smile and oral function. However, many people are hesitant to get dental implants because it involves a surgical procedure. Dr. David Weinman simplifies the process to receiving dental implants by performing the entire procedure from start to finish right in his office. As an implant dentist in Westfield, Dr. Weinman has everything you need for a simple, convenient implant procedure. To benefit from dental implants, you’ll have to undergo a multi-step procedure that also requires imaging and consultations to ensure a successful treatment. Often, while a dental office offers dental implants, they are unable to perform the entire procedure in-office. As a result, you will be sent to various locations and see different dentists for each phase of treatment. By having to visit different locations, it can lengthen the amount of time it takes to receive implants, while also making patients feel uncomfortable by having to visit different dentists for each procedure. 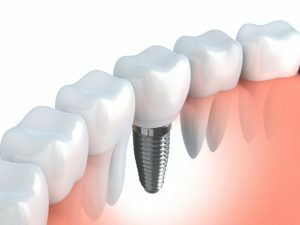 Dr. Weinman simplifies the process and offers greater peace of mind because the entire implant procedure will be handled in one office. From start to finish, your entire treatment will be handled by Dr. Weinman from one convenient location by a doctor you already know and trust for peace of mind. To begin the process, you’ll need to undergo a consultation and images will be needed. A CT scan is used in-office to better understand the health and structure of your bone. The images will determine if any additional procedures are needed, such as bone grafting, while allowing for precise implant placement. Using the images, a treatment plan is created. The first phase of the procedure involves surgically inserting titanium posts into the jawbone. After the posts are implanted, your bone will naturally accept the bio-compatible material and fuse to the posts. Once your bone has healed to the implants, you’ll move on to phase two of treatment. Phase two involves placing abutments on the implant posts, which anchor the prosthetic teeth to the crowns. With the abutments in place, Dr. Weinman will attach your custom-made crowns for a stunning new smile. If you’re interested in dental implants, choose the dentist in Westfield who is able to handle the entire procedure from start to finish in-office. Call Dr. Weinman today at (908) 543-7629 to schedule a consultation.